It took me about 32 hours of travel before I reached a bed in Barcelona, the first city to mark my return to Europe after a month's hiatus in America. That is a lot of hours. I know. Let's not get into it. But let's do get into this: I learned that when you're jet-lagged in a way that the lines between human and zombie become blurred, there is only one real cure. Approaching the bundle of calçots for the first time how could I have known what greatness awaited me? Translation: Spring Onions? Leeks? Something in between...(I'm leaning toward defining them as leeks, but I haven't quite established if that's exactly what they are). Onions, people. It's one word. One vegetable. One amazing thing that you think you already know...but you have no idea. If you casually have a huge pizza oven in your possession any food you cook is probably going to be good. As a rule. We unleashed and trimmed the base of the calçots before preparing them for the char. This story starts with a young couple named Josep and Gabrielle. As the only people in Barcelona to open their home to us after sending out over 30 Couchsurfing requests, I was feeling pretty good about these two. 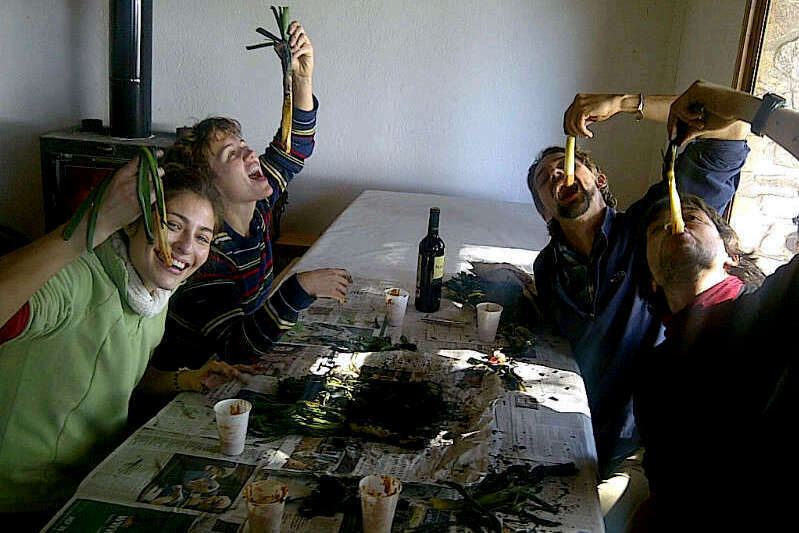 So when they invited us along to a calçotada (which is essentially a leek cookout) that Josep's dad would be having in the nearby mountains the morning after our arrival, we didn't even consider turning the offer down, jet-lag be damned. It's leek season in Catalonia, which, if you don't already know, is a region in Northeastern Spain. I suppose it's leek season in parts of America too, but since most Americans are used to buying whatever fruit and vegetable they want any time of year regardless of its provenance, I doubt that we pay attention to trivial things like seasonality (or sarcasm, for that matter). Luckily, the Catalonians do. Father and son in action. Notice that the calçots have to get super charred, and once one side is finished, a rack is placed on top so as to "sandwich" the calçots between two racks to make them easy to flip. Ah, the purrón. I have a feeling we will be seeing more of you on this trip. 4. Bundle 10-15 together and wrap in newspaper, letting the calçots steam themselves from the outside in. 5. After about 15 minutes, take a leek, hold all the inner-most "stalks" at the top and the edge of root that you left in-tact in step two. 7. Dip said edible portion in homemade Romesco sauce. Dip, raise, and lower. And take low-quality cell phone pics. Let the calçots steam themselves from the outside in bundled up in their newspaper sleeping bags. A local meal plus recycling! Because this Romesco sauce was so absurdly good, I somehow charmed our version's creator into telling me more or less how it was made. It's hard to go wrong on this, so add more tomatoes or throw in a roasted bell pepper or any skinned pepper if the fancy strikes. And use the sauce with almost anything: Meat, veggies, french fries, you name it. Heat oven to 400 Fahrenheit. Toss or brush about 2 tbs of EVOO to cover tomatoes and 8 whole garlic cloves. Place on baking sheet and roast until soft and caramelized (i.e. beginning to brown), about 30 minutes. Reserve roasting liquid. Pinch off tomato skins after they've cooled for about 10 minutes. Pulse nuts in food processor a couple of times, then add roasting liquid and all other ingredients except for the EVOO and bread. Pulse 4-5 times. Turn processor on medium-low and slowly add EVOO until desired consistency is reached. Texture should be thick and slightly coarse, but smooth enough so that it will yield when you dip something in it, think: something between tapenade and ketchup. Taste, add more red wine vinegar, salt, or pepper if desired. If mixture turns out a bit runny for some reason, tear off 1-inch chunks of the bread and add until satisfied. Lamb ribs with local chicken and sausage. And all the Romesco sauce you could dream of. Although I had completely filled up on calçots, Josep's dad then proceeded to pull out what seemed like limitless amounts of meat for the grill. Who's completely full? Not me. You think we could handle dessert after all that? Of course we could. But listen, did I tell you yet that Josep's dad is a beekeeper? So not only did we have Spanish oranges with honey, we had them with local honey, as in honey made about 10 feet away from where I was standing. I was hanging out with the very bees that made the stuff. Little did I know that I would be hanging out a bit more personally with the bees, because somebody decided it would be a good idea for John and me to suit up and follow the head man down to the hives. Using the smoker device calms the bees down. Smoking: either ramps you up or slows you down. Ugh. Had I really arrived to Barcelona the night before, or was I still on the plane dreaming? What if all my days in Spain end up being like this...!? P.S. Like me on Facebook and you'll find more Chowgypsy pictures! Oh so good. What a great start.